Summer, everyone’s favorite season, but with summer, there also come bug bites. 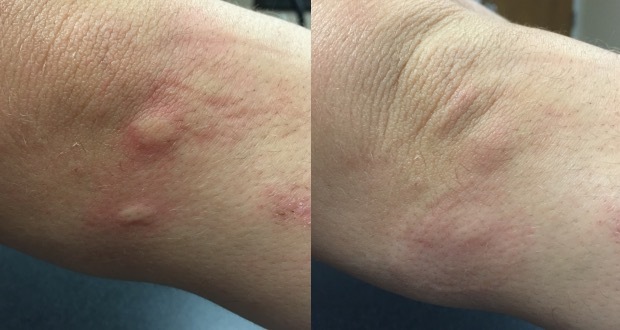 Somehow, it seems impossible to avoid getting a mosquito or bug bite during summertime. Isn’t that annoying? That itch is so frustrating! To combat the annoying itch, most of us use creams specially created for this purpose. But, did you know you can make an anti-itch cream on your own? Fortunately, making it is extremely simple. Now you’re probably thinking it’s easy to buy bug spray instead. But, is bug spray safe? Many insect repellents contain a chemical called DEET, developed and tested in the 1940s and 1950s by the US Army. Although the chemical is very efficient in warding off insects and preventing bug bites, numerous safety concerns are associated with it. For example, one study found that DEET can interfere with the activity of enzymes that are essential for the proper function of nervous system. Going to the store and buying a cream or spray is easy, everyone can do it. That said, these products often contain potentially harmful ingredients that don’t only affect your skin, but overall health as well. Making your anti-itch creams is a safer alternative, and you don’t even need too many ingredients. Below, you can see how to make one of these creams in your home easily. This is a fantastic recipe from Wellness Mama that I’ve had a lot of success with till date. First, combine zinc oxide with sea salt, baking soda, and bentonite clay in a small bowl or a glass jar. Then, add witch hazel and stir. Keep stirring until you get the desired consistency. When you are happy with the consistency, then add the essential oil, and that’s it. To reach the desired consistency easily, start with the lowest amount of ingredients and keep increasing the amount as you’re stirring. Once you reach the preferred consistency, your cream is ready. Store the cream in an airtight jar and use within two weeks. Dab a finger into the cream and apply onto the itchy area a few times a day or when needed. This cream also works for different types of rashes. Ideally, you should keep the cream in a colder environment e.g. in your fridge. In a small saucepan, heat the witch hazel until warm to the touch. Then, add salt, and once it is dissolved it is time to add menthol crystals, stir until they dissolve. Proceed to add the aloe vera, apple cider vinegar, and essential oils. Stir carefully and transfer the mixture into a spray bottle that you should store in the fridge. The recipe contains amounts necessary for the 4-oz bottle; you can add more for a bigger container or use lower amounts for a smaller bottle. The spray can last up to a few months, and you can use it when necessary i.e. when notice redness, swelling, and experiencing itchiness. Spray 1-2 times on the affected area to get the cooling effect and pain or swelling relief. While we love summer, nobody likes bug and mosquito bites, especially the frustrating itchiness. To avoid this, you can make your creams and sprays to relieve redness, swelling, pain, and itchy skin in an entirely natural and safe manner.